Australian Deserts make up a big part of what is known as "the Australian Outback". You might have heard the term "the Outback Desert of Australia". That name is misleading in two ways. First, it sounds as if there was one big desert in Australia, the Outback Desert. Hmm, not exactly true, there is no desert called Outback Desert, as you can see on the Australian desert map below. Well, that's not exactly true either. 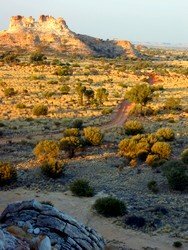 Read more about this in my article What is the Australian Outback? Having said that, it is true that the interior of Australia is one big desert region (Australian Desert Facts). In the past these areas have been inhospitable and forbidding places that were hard to access, and of course dangerous. That has changed. Today our deserts are becoming increasingly popular with tourists looking for something different. People come for the stunning scenery, magnificent rocks and gorges and coloured sands, the unique plants and animals in the desert. But also to experience the open spaces, quietness and solitude and to get away from the hustle and the crowds of the coastal cities. Australia's cities, coasts and beaches are beautiful, no doubt about that. But what you find there can be found in other parts of the world as well. The deserts of Australia are unique. Nothing compares. And nothing that's anything like them can be found anywhere else in the world. The Australian deserts listed below make up about 18% of this continent, but a full 35% of Australia receives so little rainfall, it is classified as desert. 70% of the country is classified as arid or semi-arid, which means it gets less than 500 mm of rain a year. That makes Australia the driest inhabited continent on Earth. Only Antarctica is drier. Only 3% of the Australian population live in those dry 70% of the continent, the rest of our people is concentrated on the coasts. 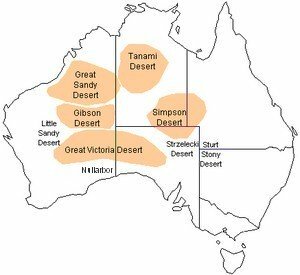 The main reason for the formation of the Australian deserts is their location. Hot moist air rises at the equator. It cools as it moves north or south, the moisture condenses and falls as abundant rain onto the tropical regions. Finally the now dry air sinks over the subtropical regions, warming as it sinks, which encourages evaporation, and voila: you get more evaporation than rain, perfect conditions for the formation of a desert. While climate change means most of Australia is experiencing the worst draught ever, it also means that rainfall in the Australian desert is increasing! The Nullarbor Plain or "Nullarbor Desert"